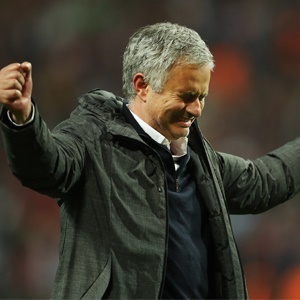 Manchester - Jose Mourinho believes Manchester United are equipped to maintain his remarkable second season success rate by winning the Premier League title this term. Mourinho has won the domestic league title at the end of his second year in each of his five major management jobs. He achieved the feat at Porto, Chelsea twice, Inter Milan and Real Madrid, with the only exceptions to the rule being his first two management roles, at Benfica and Uniao de Leiria, where he lasted less than a season in both cases. Mourinho goes into his second season at Old Trafford needing significant improvement in the Premier League after United finished sixth in May. However, the club did win the Europa League and the League Cup, giving the manager a platform of success on which to build. Mourinho's optimism is based on three beliefs; he feels he has a more settled squad than when he arrived, that they have had a better pre-season than 12 months ago and that their rivals at the top of the division will have greater distractions in European competition this time. "What would it mean for me to be the Premier League champion? I think it is the objective of every one of the top teams and every one of the top team managers," Mourinho said. "I don't think I am going to win it because I always win it in the second season. Not at all. "I just think that naturally, a manager in the second season knows the players and knows the club better. "I don't say I know the league better because I have been in this league for a long time. "We are in a position to do quality work better than we did in the first season, so I am convinced that our second season, in terms of the quality of our team, is going to be better. "I have conditions to deliver a better team than I did in the first season. If that is going to mean better results and the title, I don't know." Mourinho's side begin their Premier League campaign at home to West Ham on Sunday having enjoyed a strong pre-season, winning six out of seven friendlies before losing to Real Madrid in the UEFA Super Cup on Tuesday. That is a big change from a year ago, when United played only five pre-season matches after a friendly against Manchester City in Beijing was called off. The arrivals of defender Victor Lindelof, midfielder Nemanja Matic and striker Romelu Lukaku have also improved the squad. However, Mourinho has lost a number of key players to long-term injury, including defenders Marcos Rojo and Luke Shaw, and wing-back Ashley Young. While Mourinho has welcomed the new signings, he argues that of greater significance is the fact his team will not have their domestic fixture list disrupted by the Europa League this season. While United had to deal with playing regularly on Thursdays and Sundays on their way to winning the competition in Stockholm, Chelsea eased to the Premier League title with no European football to worry about - and neither did Liverpool, who took fourth spot as United finished sixth. "I think everybody is in Europe. The top seven, we are all in Europe. Last season, two of them were not in Europe," Mourinho said. "This time, we are all in the same basket. It is going to be the same for everybody. "Arsenal and Everton are in the Europa League and they have to play Thursdays. But the top seven, we are going to be in the four competitions and so there is no advantage for any one of us."